Today, I visited a state park with my father, sister, and dog; the occasion was Duncan’s having turned ten years old on Thursday, June 7! 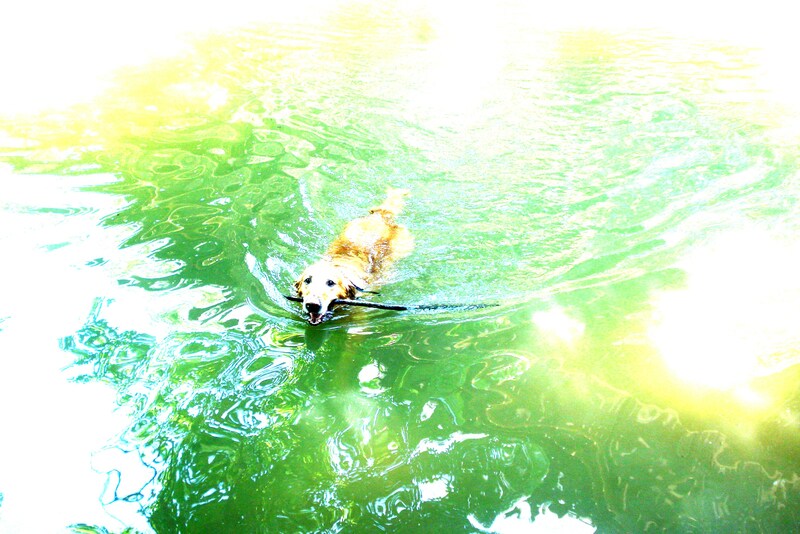 Our activities, of course, focused completely on Duncan’s tastes: throwing sticks into the water for him to fetch while he swam his great big golden heart out. We know that people learn and grow in a variety of ways from spending time outside in nature – exercising, seeing plants and animals, exploring new places, developing social and survival skills. The No Child Left Inside Coalition documents and shares the benefits of environmental education. At Patapsco Valley State Park in Maryland (where we went today), human visitors can hike, fish, ride horses, picnic, view historic structures, camp, canoe, bicycle, paddle, tube, golf, play basketball/baseball/volleyball, bird-watch, explore the nature center, and take lots of photographs. Kids can play on playgrounds, or their parents can sign them up for special programs that involve activities like stargazing, storytelling, making birdhouses, searching under logs for insects, and conducting a stream survey. Learning how to make paper, or planting a garden, or watching and listening for owls during a nighttime nature walk can enrich textbook reading on the same subjects. What about dogs? What do they learn from being out in nature? I have heard the saying that sniffing all the outside smells during a walk is, for dogs, the equivalent of reading the front page of the newspaper for us human beings. Through their strong olfactory sense, canines find out all sorts of things about what happened on a particular patch of grass. Bringing a dog to a place not on its everyday walk route offers an array of exciting new fragrances. Pooches need enrichment, from fun toys for their alone time during the workday, to walks every day, to interaction with and affection from their people. Boredom leads to behavior problems. For Duncan, a golden retriever with hip dysplasia, swimming is both his favorite activity and the healthiest form of physical exercise for his condition. If we had a million dollars, we would build him a pond of his own, but in the absence of that dream coming true, area parks that allow dogs to swim are great resources. 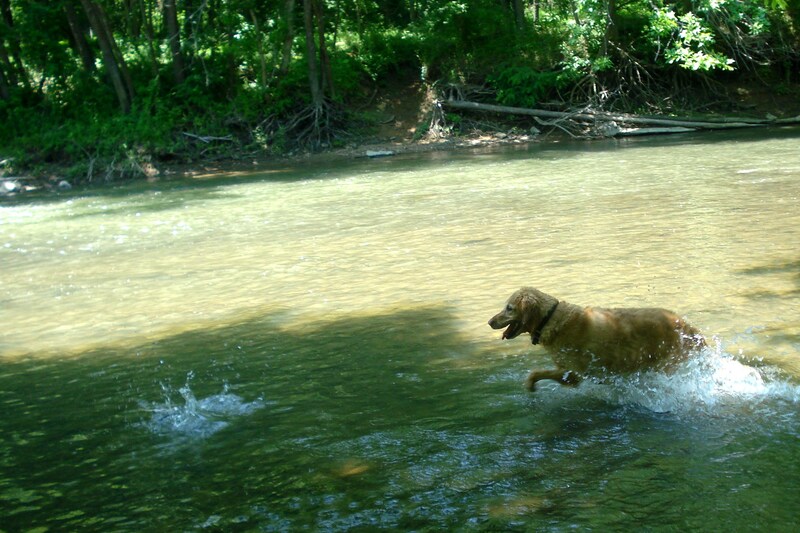 It seems inaccurate, however, to say that Duncan learned to swim during his times in the water. Rather, he appeared to learn that he knew how to swim. He attended his first pooch pool party when he was one year old. When he entered the water, he hesitated for a few seconds, and then he suddenly started swimming. In the words of my mother, “It was like a revelation.” We think that, aside from when he first arrived at our home, it may have been the most momentous event of his life. June’s blog theme is Learning from Objects: Primary and Secondary Sources. Paralegal with Master of Arts in Teaching in Museum Education, frequent museum visitor, based in Washington, DC. I care about what museums can do, both in terms of public offerings and internal practices, to make the world a better place. I blog about museum education ("informed"), the social work of museums ("humane"), and visitor experience ("citizenry"). This entry was posted in Museum Visits (Other), Photos and tagged Duncan, MD, parks, Patapsco Valley State Park, state park. Bookmark the permalink. Thanks for following our blog and thanks for sharing this post 🙂 It was fun checking out your blog. Thank you for visiting mine! I love going to vegetarian restaurants and will do so if I’m in your area. "Not Man Apart from That"